Games I Made My Girlfriend Play | An avid gamer shares his favorite pastime with the woman he loves. Earlier last year, Chip released a video game zine called Component that featured essays and artwork from talented artists and writers. The first issue was filled with stories about the contributors’ most cherished games, featuring titles like Mega Man 2, Spyro the Dragon, and Okami. Now, we are happy to announce that the second issue of Component is available for your reading pleasure! Issue Two focuses on role-playing games. While each player has different tastes and favorites when it comes to this genre, we have all found ourselves caught up in these adventures. RPGs provide strong narratives and complex systems in which we can become immersed and play a character in a totally different world. At the same time in our own reality, these games help us forge lasting friendships and uncover fascinating truths about our own personalities. Games highlighted in articles and artwork of Issue Two include Dungeons & Dragons, Super Mario RPG, Fallout 2, Xenogears, Final Fantasy VIII, Legend of Dragoon, Shadow Hearts, Fable II, Skyrim, Dragon’s Dogma, Bravely Default, and Yo-kai Watch. Just like Issue One, the latest issue of Component is available as a print-on-demand magazine and as an instant PDF through MagCloud . The editor and contributors of Component thoroughly believe in gaming for good causes, so 100% of the profits from Component will be donated to charity:water to fund clean water projects in the developing world. Thanks for reading and please be sure to check out Component for all sorts of gaming goodness! After weeks of gorging on spooky video games and consuming mass quantities of Autumnal foods, the day is finally here- Halloween has arrived! Of course, our favorite time of year wouldn’t be complete without a video game themed jack o’ lantern haunting our doorstep. This year, Laura and I have chosen an upcoming title for which we are particularly excited as the subject of our pumpkin carving. As a special treat, we thought a look back at the Ghosts of Pumpkins Past™ would make for a frighteningly fun addition to the usual festivities. So please enjoy GIMMGP’s Gallery of Gourds, and as with every year, have a safe and Happy Halloween! Many moons ago, reddit users were asked to come up with horror stories that are only two sentences long. Many of the tales spawned from this request are quite creepy and leave a lingering unease, in spite of their length. The most effective of these stories play on universal human fears and utilize the reader’s ability to extrapolate the narrative even further. Due to their nature, these two-sentence musings provide few details as to the setting or the characters involved. There is no time to explain or to build the surmounting terror; the reader is thrust into a story in motion at the climax of a bad situation. As I read through these very short stories, I wondered: could a video game scare players under similar constraints? When gamers make a list of the best survival horror titles, the featured games often have one trait in common: an atmosphere of dread. From small towns infested with monsters to remote space stations that may not be as empty as they seem, these settings are crafted to put the player on edge. So much work goes into the ambient sound and visuals of each area, so the player does not need a bulky narrative to explain why he/she should be frightened. Despite this effort, the developers of such titles take the time to build a complex story. The best of these games make use of both setting and story to create an engaging game, while the worst of them clutter a potentially chilling experience with unnecessary areas and exposition. Across the board, these games follow the traditional three-part mold of a feature-length film. It’s almost as if a horror game has to contain certain story elements and have a lengthy playtime to be a success. 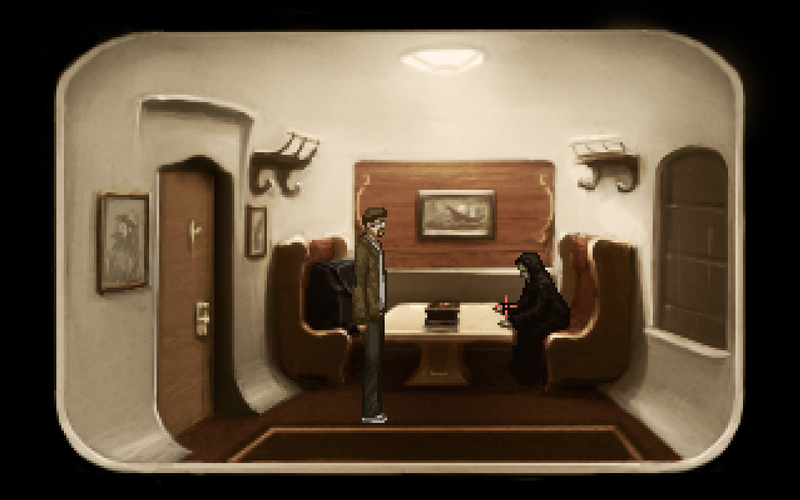 Enter Sepulchre; a point-and-click PC game from Owl Cave. From the developers’ website: “It’s a game featuring horror, trains, and huge bags. It should take most people around half an hour to play through.” A perfect example of truth in advertising, Sepulchre took roughly forty minutes to complete, during which time I took control of a passenger on a train, eager for a bite to eat. Like the two-sentence short stories, this game does not require much set-up to cause a sense of dread. The lack of information, along with striking visuals and sound, created a foreboding atmosphere that lingered long after completion. It seems a video game can incite fear under heavy constraints. If you are looking for a short jaunt into an ominous world not so unlike your own, please check out Sepulchre. Your time together may be brief, but the horror will last a lifetime. There are certain songs and sounds that call to mind terrifying experiences. Classic horror movie themes rely on specific melodies to conjure uncomfortable and haunting memories to the mind of the viewer. In the case of video games, a repeated theme or visceral noise can be used to emphasize the power of a specific scene. Very early in Undertale, the player may find a pair of spider webs surrounding a sign that reads, “Spider Bake Sale. All proceeds go to real spiders.” The player is presented with an option to purchase a Spider Donut or a Spider Cider, payment made by leaving money stuck to one of the webs. As a devout arachnophobe, this little scene made my skin crawl. I pictured the spindly legs of spiders stirring donut batter and pouring cups of cider for horrifying local bake sales. With limited funds (and a fear of eight-legged bakers), I decided not to leave any sort of monetary gains for these little monsters. Little did I know that by supporting the efforts of the spider-kin of Undertale, I would avoid battling their leader, Muffet. Later in the game, as I made my way through a room filled with cobwebs, I was ensnared by the leader of the Spider Bake Sale. For not supporting her efforts to liberate her arachnid comrades from the cold of the Ruins, Muffet lashes out at the player; attacking with unique spider-themed strikes. The music for Muffet’s battle (appropriately called Spider Dance) calls to mind the spindly movements of a spider. A frantic melody launches from the start of the song; calling to mind the feeling of first laying eyes on a spider that has invaded your space. This gives way to a minimalist string sample, which simulates the actions of a spider spinning a web to capture their prey. The whole song is intense, engaging, and appropriate for the frantic battle with Muffet. As with so many of the themes in Undertale, composer Toby Fox uses leit motifs across tracks to emphasize a certain theme. In the case of Spider Dance, this song shares its melody with equally haunting tracks like Ghost Fight, Pathetic House, and Dummy! Each of these songs centers around otherworldly encounters; where the player is faced with haunting moments that could scare them into submission. Of course, any frightening situation can be overcome with enough… DETERMINATION. On Saturdays through the month of October, we will be cross-posting the latest video game and beer pairings from Chip’s new blog, Digital Draughts! Normally written on a semi-monthly basis, Digital Draughts will feature frightening and fantastic pairing posts through October as a treat for you, dear readers! Please be sure to subscribe to Digital Draughts for future beer and video game pairings, and follow the related Instagram account for all of the pours and plays between the main posts! There are times when I encounter a new experience and I can immediately tell that my attitude has been altered. A previously undiscovered book becomes a new manifesto for my reading preferences, or the first taste of a new cuisine refines my palate. But not all life-changing moments feel as though your status quo has totally shifted. It can take years of additional experience before the proper perspective can settle for a particularly transformative incident. When I first tried the components for today’s pairing, I enjoyed each of them at face value: the latest in a beloved survival horror series and a solid seasonal beer from an established craft brewery. Now, with over 11 years since my first play and nearly 8 years since my first taste, I want to revisit these experiences with an updated perspective. My love for pumpkin-flavored treats is a well-documented psychosis. From my first taste of pumpkin pie as a child, I was hooked on the taste of gourd and spices. So it makes sense that I would enjoy the seasonal beers of autumn as an adult. However, restrictive distribution routes limited my first pumpkin beer options to bland offerings from domestic beer companies. It took a massive relocation to provide me with the opportunity to try a pumpkin brew with a some bite to it. It was the label that first drew me to Flying Dog Brewery’s seasonal beer. Ralph Steadman’s surreal and terrifying artwork of a snarling canine beast loomed from the packaging. The side of the bottle featured an equally aggressive piece of copy; daring the drinker to, “learn to embrace THE FEAR that consumes you.” I heeded their advice and took the challenge of this imperial pumpkin ale. At the time, The Fear was unlike anything I had ever drank. Instead of a sub par beer with cloying allspice/cinnamon flavor, I was treated to a hearty ale with intense flavors of ginger and baked pumpkin. The Fear set a new standard for pumpkin beers, which I was surprised to be met so quickly by other delicious seasonal craft offerings. With so many other interesting autumn brews on the shelf, my dance card became quite full, leaving little room for The Fear in the years to follow. But I made sure to clear a recent evening to check in with the brew that started my journey down the dark path of pumpkin beers. The Fear pours cola brown framed with a red-orange hue and topped with a fizzy toasted marshmallow head. The spices used in this brew are at the forefront of the aroma, as a strong nose of ginger and nutmeg lead into mild notes of baked pumpkin with a dash of cinnamon. The ginger continues to lead with a tangy bite at first sip. This kick of spice quickly dissipates into a pumpkin bread body with a toasty finish and a hint of dark chocolate. As The Fear is an imperial ale, the piquant bite of 9.0% ABV is present, but well-balanced against the pumpkin pie flavor. After sampling dozens of autumn brews over the years, I am pleasantly surprised to find The Fear stands out from the crowd. Its strong ginger flavor and roasted pumpkin notes are still delicious and unique. With a glass of this striking beer by my side, I was ready to hook up the GameCube and take on the mission to save the President’s daughter once again. Resident Evil 4 hit store shelves during the latter half of my junior year at college. Around that time, I had found my gaming tribe at school and we were all eager for the latest in our preferred survival horror series. Even though each of us had pre-ordered our own copy of the game, we all gathered at a single apartment to watch the game unfold. Across multiple televisions in a single room, we each began our journey as Leon Kennedy. Despite playing as a protagonist from a previous entry in the series, this game did not feel like the Resident Evil to which we were accustomed. Instead of the foreboding hallways of a derelict mansion or the oppressive destruction of a city under siege, Resident Evil 4 dropped us in the wide open villages of rural Spain. Gone were the mindless zombie enemies, replaced by mad villagers who could utilize weapons and actually dodge our attacks. Even the core gameplay was changed; placing the camera over Leon’s shoulder and increasing the options within the combat mechanics. The whole experience felt more like an action movie than a suspenseful thriller, which turned out to be exactly what we were looking for. I fell hard for Resident Evil 4. I loved the increased action and expanded verb set, but also appreciated that the tension remained throughout the experience. Even though Leon was a well-trained government agent, he was still regularly challenged by the maniac hordes of the Los Illuminados cult. In addition to the main storyline, there were extra gameplay modes that kept me in great competition with my friends. We regularly tried to compete for better scores in the Mercenaries survival mode and all of us raced to collect the tiny virtual figurines offered at the Shooting Gallery. We played through the story again and again, trying to find every collectible, upgrade each weapon, and generally speed through the game with greater ease. Resident Evil 4 was a great game to discover and play with friends by my side. But once I left college, I rarely found the time to replay this game that I had so enjoyed. I dabbled with the sequels that followed, but there were so many other survival horror games spilling onto the market that I wanted to try. To further complicate matters, there was a distinct split in the survival horror genre following Resident Evil 4. Some games leaned into the action elements, forgoing any sort of suspense and subtlety and focusing on mowing down horrific monsters with bigger and bigger guns. The other side of this coin gave up on empowering the player; purposefully placing you in terrifying situations with little resources or hope of surviving. As it turned out, I started preferring the more cerebral and suspenseful horror games, which pulled me further away from the series that started me on this path. So I was very curious to see how my feelings had changed towards Resident Evil 4 after playing so many other titles within the genre. Right from the start I noticed one thing had changed drastically since the last time I played Resident Evil 4: my skill level. I am downright terrible at this game. I struggled to make well-aimed shots at my enemies, often wasting piles of bullets and dying repeatedly to basic scrubs that were previously no problem. Despite this refreshed difficulty, I am still enjoying the tension provided by the combat. Every encounter with basic enemies is a challenge to effectively eliminate targets while avoiding being overrun. It’s a balance that remains impressive even years later. The visuals and sound design are equally stunning, in spite of their age. The expressive character models and amazing lighting still look good, even when upscaled from the GameCube’s A/V output. The story and voice acting have not aged as gracefully, with some truly hammy lines popping up time and time again. The main villain of the game sounds like a discount-store Dracula impersonator, and some of our lovable ally’s dialogue has only become more uncomfortable over time (“I see the President has equipped his daughter with ballistics, too”). Quick-time events continue to be a massive frustration, often creating easy-to-fail scenarios that contribute nothing worthwhile to the game. I was surprised how little I enjoyed the boss encounters when playing again. Instead of feeling like clever puzzles or strategic battles, fighting major enemies felt like obnoxious bullfights; running around a tight arena and unloading massive amounts of ammo in lumbering meat walls. Alternatively, my love of the item management system has only become more acute; every moment spent arranging ammo and recovery items in that briefcase felt like a delightful little puzzle game break. Overall, Resident Evil 4 doesn’t hold the same sense of wonder from the idyllic days of playing with my friends in college. I no longer have the time to invest in this massive game and its many additional modes. However, playing Resident Evil 4 after so many other lackluster survival horror titles makes me further appreciate what an impact it had on my personal taste and video games as a whole. This game became my benchmark for quality of design and the joy of play in the survival horror genre. I am pleased to find that Resident Evil 4 remains as that standard even after so much time has passed. Minor complaints aside, I still recommend Resident Evil 4 for anyone looking for a great action title or survival horror game, which pairs very well with the spicy bite and tasty pumpkin notes of The Fear. Nearly 18 years ago today, my brother and I set out to be the very best, like no one ever was. Catching Pocket Monsters was our first real test, but to train them, aye, that was our cause. Pokémon had hit the shelves not a week prior, and our parents graciously gifted both versions of the Game Boy classic to us. My brother received Pokémon Blue, and became a great trainer of water-types, with a stately Blastoise at the helm of his troop. 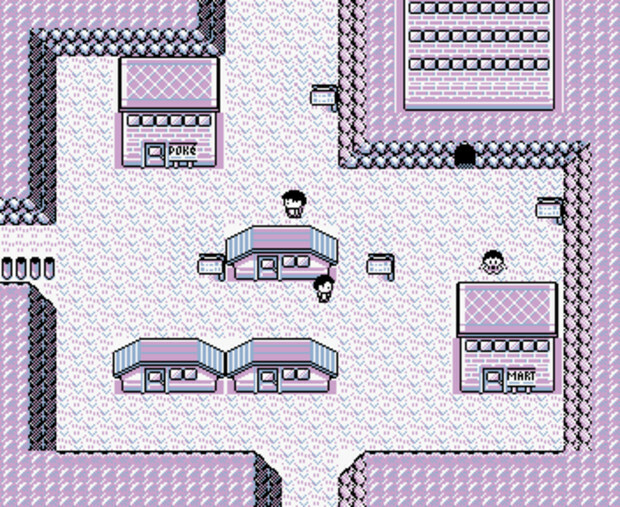 I was given Pokémon Red, but I did not find my true calling in this game until I ventured into the tower at Lavender Town. It was at this resting place for fallen Pokémon that I would catch my first Gastly, which cemented my destiny as a ghost-type trainer. 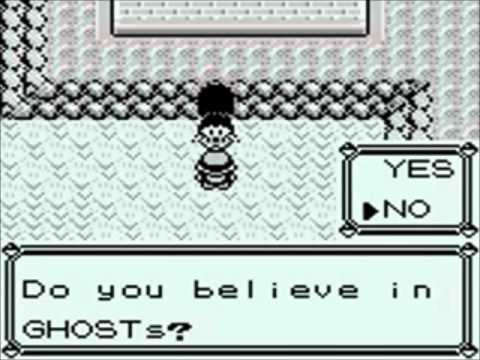 With each new journey into the world of Pokémon, Nintendo would increase the number of ghost-types to catch and raise. As a young trainer, I delighted with each new phantom that became available; marveling over the new designs and attacks. But once I grew older, I started to notice that my beloved ghost-types harbored a much darker nature. With just a quick glance through my trusty Pokédex, I found stories of hauntings and torment; tales of restless spirits that prey on the souls of the living. Just take a look at some of these examples below! 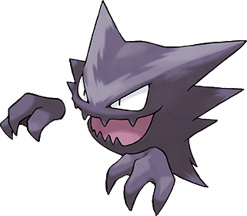 Haunter: Its tongue is made of gas. If licked, its victim starts shaking constantly until death eventually comes. In total darkness, where nothing is visible, Haunter lurks, silently stalking its next victim. 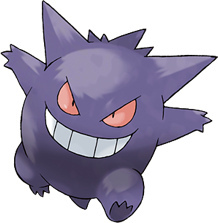 Gengar: To steal the life of its target, it slips into the prey’s shadow and silently waits for an opportunity. The leer that floats in darkness belongs to a Gengar delighting in casting curses on people. Misdreavus: A Misdreavus frightens people with a creepy, sobbing cry. It apparently uses its red spheres to absorb the fear of foes as its nutrition. It likes playing mischievous tricks such as screaming and wailing to startle people at night. 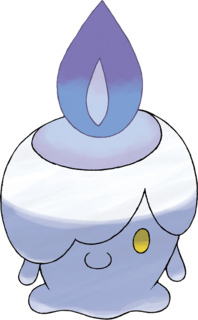 Litwick: Litwick shines a light that absorbs the life energy of people and Pokémon, which becomes the fuel that it burns. While shining a light and pretending to be a guide, it leeches off the life force of any who follow it. 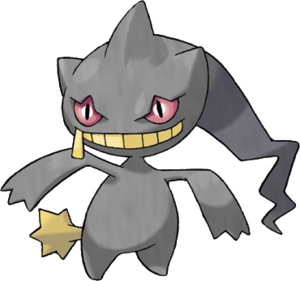 Banette: A doll that became a Pokémon over its grudge from being junked. It seeks the child that disowned it. 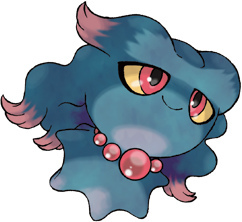 Banette generates energy for laying strong curses by sticking pins into its own body. This Pokémon was originally a pitiful plush doll that was thrown away. 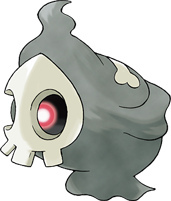 Duskull: Duskull wanders lost among the deep darkness of midnight. There is an oft-told admonishment given to misbehaving children that this Pokémon will spirit away bad children who earn scoldings from their mothers. It loves the crying of children. It startles bad kids by passing through walls and making them cry. Once this Pokémon chooses a target, it will pursue the intended victim until the break of dawn. Mimikyu: This Pokémon lives its life completely covered by its cloth and is always hidden. People believe that anybody who sees its true form beneath the cloth will be stricken with a mysterious illness. This Pokémon is dreadfully lonely, and it thought it would be able to make friends with humans, if only it looked like Pikachu. *Brrrr* That is some creepy stuff! Little did I know that the most tragic and gruesome tale of all would lie with a normal-type Pokémon. 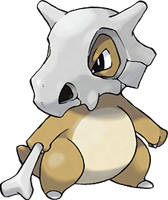 I am speaking of none other than Cubone, the sad little creature who wears the skull of its dead mother. When it thinks of its mother, it cries, making the skull it wears rattle with a hollow sound. Now, when you first look at this little monster, you may feel sorry for it and want to take it home to be your friend. But put that situation in human terms, and the mood completely changes. After all, would you be friends with someone who wears their mom’s skull as a hat? I didn’t think so. During the 1990s, there seemed to be a glut of spooky romance across various media platforms. Movies like The Addams Family and Nightmare Before Christmas shared eerie love stories on the big screen, while authors like Anne Rice and Laurell K. Hamilton provided supernatural intimacy on the printed page. At record stores, there was no shortage of music with themes of Gothic adoration, and video games were starting to come into their own with telling stories of otherworldly love. While I would hardly consider Grim Fandango to be a horror game, its story and subject matter certainly revolve around death. Our intrepid hero Manuel “Manny” Calavera is a travel agent for recently departed souls entering the Land of the Dead. As he begins to uncover a plot of crime and corruption within his employer, the Department of Death, Manny meets a virtuous soul named Mercedes “Meche” Colomar. At first, Manny merely thinks of Meche as his ticket out of his dead end job. If Manny can score a client with an honorable life such as Meche’s, he believes this will work off his debt so he can move onto a true afterlife of rest. But when Meche’s chance at a golden ticket to the Ninth Underworld is stolen from her, Manny begins a quest that will ultimately lead him to fall in love with Meche. Over the course of the game, a certain piece of music pops up as Manny and Meche begin to show feelings for each other. The exact instrumentation varies in each scenario, but the basic melody calls to mind a haunting dance between two souls. Soft strings resonate feelings of love and sorrow; the struggles of a romance that has been tested by difficult circumstances. There was a time when I regularly wrote about comic book adaptations of video games over at the Geek Force Network. While that time has come and gone, you can still enjoy the numerous articles I penned about such media crossovers at the archives. Here is one such post from those halcyon days, just in time for the spooky October season. It’s that time of year once more; when the barrier between the natural and supernatural is at its weakest and little ghouls haunt the streets in search of sugary treats. For this week’s video game comic column, it only makes sense to venture into the darker side of the printed page. There is a rather massive subgenre of horror comics, and its tentacles stretch far into the video game world. So let’s dive into a realm where monsters do battle in rounds of two, until only the strongest survives. It was back in November of 2004 that Udon Entertainment debuted their Darkstalkers comic series. At this time, Udon was releasing their work through Devil’s Due Publishing, which included a Street Fighter comic series that launched in 2003. The Darkstalkers comic ran for six issues, until it abruptly stopped in April of 2005. In October of the same year, the chief of operations Eric Ko, announced that Udon had become a full-fledged publisher and its lengthy hiatus was due to producing material for the video game Capcom Fighting Evolution. Since that time, Udon has grown into a massive comic book and video game powerhouse, producing several comic series, art books, and work for video games such as Super Street Fighter II Turbo HD Remix and New International Track and Field. From this rather bare bones plot, Udon crafted a solid story about the various machinations of the Darkstalkers who hide in the dark corners of the Earth. In this six issue series, the conflicts between certain characters take center stage, while the sideline characters are left as mere window dressing. So while Dimitri and Morrigan prepare for an eventual battle of the ages, Rikuo and Lord Raptor only show up briefly in side stories and single panel shots. Every issue features plenty of great fighting scenes, complete with signature moves and plenty of nods to the fans of the video games. There is also loads of background on many of the major characters, including several side stories that flesh out their motivations even further. As with most of the comics from Udon Entertainment, the artwork really shines. The horror themes of the video games allowed the artists to include plenty of heavy contrast and shadows, which really lend to the atmosphere of the comics. The characters remain in the anime-inspired style of the fighting games, but with more vibrant colors and further detail for better expressions. In spite of the show-stealing appeal of the characters, the backgrounds have not been overlooked. There is plenty of detail in the settings of each scene, with some panels exclusively dedicated to moody environmental shots. Besides the solid story work and gorgeous art, my favorite part of Darkstalkers comes at the end of each issue. A single page is always dedicated to a gag comic called Darkstalkers Mini. The fun work of Corey Lewis (pseudonym, Rey), these quick strips feature super-deformed versions of the fighters in silly situations, most of which end with goofy punch-lines. Unfortunately, when Udon collected the comics into a trade paperback, all of these side stories got the boot. On the plus side, that has made the individual issues of the comic unique to the trade version, so be sure to track these gems down! At the end of the first issue of Darkstalkers (right before the Mini comic), there is a writers’ commentary aptly titled, “From the Darkside.” On this page, some of the staff from Udon spill their guts about the joy they felt in creating the Darkstalkers comic books. There is talk of the great chance to write a darker story than the usual Street Fighter comics, along with their mutual love of horror films and fighting games. At the very end, the colorist, Gary Yeung, says that the goal at Udon was to “make a faithful interpretation of Darkstalkers from a game/animation into a book.” Through action-packed stories and striking artwork, all wrapped up in a spooky atmosphere, it seems like Udon met their goal quite nicely. In the past, we used the Prelude track from Castlevania III to highlight the differences in audio and sound chips between the Famicom and the Nintendo Entertainment System. This year, we will take a look at another song from the Castlevania series that made its debut in two very different versions of a particular title. Two years later, Konami would release an alternate version of Rondo of Blood to the Super Nintendo. Titled Castlevania: Dracula X, this game featured similar graphics and level design to Rondo, but technological differences between the PC Engine and the Super Nintendo led to some drastic changes between the games. Levels were redesigned, certain pathways were altered, cutscenes were removed, and the unlockable second character became a non-playable character to be rescued. While I ultimately enjoy the experience of playing Rondo of Blood over Dracula X, I can still appreciate the music from the Super Nintendo version. The sharper guitar sounds from Dracula X call to mind countless afternoons spent playing the game as a rental from our local video store; desperately trying to make my way through this particularly difficult game. Rondo of Blood was re-released once more in 2007 as the Dracula X Chronicles for the Sony PlayStation Portable. This version of the game featured a 2.5D remake of Rondo, along with the original PC Engine version, and Castlevania: Symphony of the Night on a single disc. Despite porting nearly every other PSP game to a major home console, Konami has let this penultimate version of a Castlevania classic languish on the now defunct handheld. Not all experiences are inviting. There are many of life’s little moments that are meant to challenge us; to intrigue lesser known aspects of our being. These engagements take a bit of flexibility on the user’s part. An open mind, a grain of salt, and perhaps a spoonful of sugar are all good tools for such experiences. The result of these events varies. The experience could reveal a newfound passion, or reaffirm a suspected revulsion. But no matter what the outcome, the user and their perceptions are changed. Recently, I challenged my palate with a game from a series universally known for its adversity, combined with a beer from a company known for esoteric brewing. After our delightful visit to the Adroit Theory Brewing Company, Laura and I have been on the lookout for any of their bottled brews at our local stores. As many of their beers are small batch and limited release, the options outside of their Tasting Room are meager by comparison. However, there are still a handful of Adroit Theory brews to be found in the wild, such as their imperial porter, Black Celebration. Brewed as a collaboration with drum and bass DJ Damian Higgins (aka Dieselboy), Black Celebration (stylized as “BLVCK”) was brewed with maple syrup, blackstrap molasses, black lava salt, and then aged on oak staves. From this point, some of this complex brew was bottled, while another batch was further aged in rum barrels before bottling. At first glance, the bottles for Black Celebration seem very minimalist; clean lettering on a matte black label. There is some flourish to distinguish each variety (gold lettering on the Oak Aged and silver lettering on the Rum Barrel Aged), but little else to make this bottle stand out on the shelf. Upon closer inspection, the secret of Black Celebration is revealed. A large alchemical sigil is embossed in glossy black across the label; visible only in certain angles of light and immediately apparent to the touch. For reasons of personal taste (both in barrel flavors and label colors), I selected the Rum Barrel Aged variety of Black Celebration. Black Celebration matches its name in appearance. From bottle to glass, this brew pours coffee black with a foamy mocha head. As the beer opens up, a powerful scent of smoked vanilla and sea salt overwhelms the air. The flavor is intense: a rich maple syrup start gives way to a smoky molasses and burnt wood body. Finishing notes of roasted pork and spiced rum consummate the experience: bitter, rich, and powerful. Black Celebration is most certainly an esoteric beer. While it features the roasted malt and dark chocolate notes of a classic porter, the additional brewing components and barrel aging further the complexity of this beer. Fans of strong dark beers may be intrigued by this brew, along with folks who enjoy the unique crossroads of savory and sweet dishes. Ultimately, I enjoyed this powerful beer. The slightly meaty notes and molasses flavor complement the natural roasted flavors of a porter, while the rum aging provides a welcome spicy kick. Black Celebration is a perfect way to prepare for the challenging streets of Central Yarnham. In the past, I have bounced off of From Software’s Souls series. I made a valiant effort in Dark Souls and its sequel; trying to learn the challenging ebb and flow of their intricate systems. But in each case, I hit a massive wall of difficulty that drove me to toss my controller away in frustration (literally and figuratively). I appreciated the nuanced gameplay and unique dark fantasy setting of Dark Souls. There was simply something lacking that kept me from truly engaging with this series. Apparently, that crucial element was Gothic horror and a Lovecraftian narrative. Bloodborne takes place in the Victorian-era city of Yarnham, where a plague has turned its citizens into beasts of varying ferocity. Some of Yarnham’s inhabitants became aggressive maniacs, while others fully transitioned into giant wolf-like creatures. As the Hunter, players must survive against the monstrous townsfolk while seeking out a cure-all known as Paleblood. However, the reasons to seek this elixir are rather tenuous, as there is no clear explanation for the quest, or how the Hunter came to Yarnham in the first place. The game simply opens with a grisly blood transfusion viewed in first-person, and visions of a horrifying creature made of viscera stalking from the shadows. I will be frank with you, reader: the start of Bloodborne is unforgiving and cruel. The path leading through Central Yarnham is long and filled with mobs of crazed citizens, hungry for blood. Any one of these maniacs has the ability to catch you in a combo that will quickly kill you, so the frequent packs of enemies typically spell certain death. These basic enemies are often combined with ranged attackers, quick-striking dogs, plus-sized abominations, and no checkpoints leading up to the boss encounters. In short, you will die in a regular and bloody manner on your way through this cursed city. If this experience sounds completely unappealing, trust me- I understand. I struggled to stick with this game in the opening hours. Watching my Hunter die over and over again to the same frustrating enemy encounters was very disheartening, and I nearly gave up on Bloodborne altogether. However, once I made it past the first major boss encounter, the game became exponentially more enjoyable. Following a frantic and tragic battle with a fellow Hunter, Bloodborne offers branching pathways, multiple character builds/options, and an engaging and mysterious narrative. The history of the once-great city of Yarnham and its Healing Church slowly unfolds as the player further explores this foreboding world. The visuals of Bloodborne are equally haunting and beautiful. The power of the PlayStation 4 is put to incredible use; providing gruesome details on every monster and amazing lighting effects on each surface. I often found myself taking a moment to appreciate the grim scenery of Yarnham, taking care to clear an area of any potential threats before such respite. Having enjoyed both Bloodborne and Black Celebration, this combination should be an easy recommendation. The engaging narrative and visceral combat of this game pair nicely with the rich molasses and smoky maple flavors of this dark brew. However, the antagonistic opening of Bloodborne and the uniquely savory notes of Black Celebration prevent a universal endorsement of this challenging pair. But if you can overcome such challenges, then a dark and delicious treat awaits you, good Hunter.